Experience the unparalleled joy of living on your own tropical island paradise for a day with our tour that takes you out to remote, Peterson Cay for a day of kayaking, snorkeling, and chilling out on the beach. Peterson Cay, which is one of the Bahamas most diminutive national parks, lies only a short mile from the southernmost coast of Grand Bahama Island. This trip is perfect for practiced or novice kayakers. We will provide you with a very brief training session explaining the basics of how to paddle and also on how to stay safe while out on the water. In no time you will be able to push into the sea in one of our steady kayaks, which seats two people, and take a half-hour jaunt to an isolated beach on the northern coast of Peterson Cay. Once you get there, feel free to lay out on the gorgeous pristine sand, soak in the tropical sunshine and stare out into the tranquil sea or follow our professional guide while snorkeling completely around the smaller island. All of your stress and worries will simply melt away. Let the island breeze cleanly caress your skin and refresh your senses as your forget about your everyday frustrations. The low level of the water surrounding Peterson Cay also makes it a perfect place for snorkeling. Let our professional and well-informed guides give you a quick lesson on how to use the snorkeling gear and then you will be ready to witness the beauty that lies just below the crystal clear waters of the Caribbean Sea. Delight in an astonishing display of undersea life as you witness stunning gardens of coral and limestone reefs containing sea fans, sponges and stretches of Elkhorn and soft corals. All of these are home to a dazzling variety of colorful tropical fish, elegant sting rays and fearsome barracuda. Due to the the shallow depths of the sand bars and reefs just west of the island, Peterson Cay National Park is the ideal destination for snorkelers. The island has the unique distinction of being the only cay off Grand Bahama Island's leeward shore, contributing to the geological conditions that created such a perfect Bahamas Scuba Diving locale. After you've enjoyed your snorkeling and sun bathing on Peterson Cay, we'll paddle back to the mainland and put in lunch orders for the group. From there we will take you over to another beach, Fortune Beach, where we'll enjoy lunch at the Banana Bay Restaurant. Is hotel pick up included in the price of the tour? Yes, Hotel pick up and drop off are included in the price of this tour. Due to the need for Kayaks to reach Peterson Cay, sometimes the high winds won't allow for us to do this. If we are unable to kayak out to Peterson Cay, we will opt for a better location that isn't affected by the winds. Options are Pelican Lake or North Riding Point, depending on severity of conditions, which are upgraded tours in comparison (for no addtional cost). Please bring your email confirmation, towels, sun screen and cash for payment for your remaining balance, lunch, and the park entry. 9AM for Carnival Sensation, Fantasy, Ecstasy, Dream, Sunshine, Freedom, and Fascination 9am usually. 10AM for Carnival Liberty, Magic, and Victory. 1PM for later Carnival Fascination arrivals, no time for lunch stop on this departure, please have lunch before checking in. 8AM for Carnival Pride - no time for lunch stop on this departure, please eat before checking in, you may have time for lunch after returning to the port. 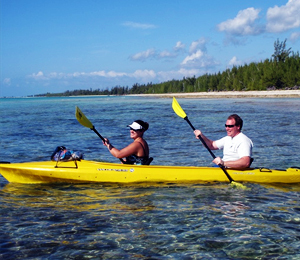 I have been to the Bahamas many times, but Peterson Cay Kayak and Snorkel Tour is one of my favorite trips! It includes everything that everyone should do here. As a Bahamas veteran, I can say only the best about this experience!